- Bob Stoops is going to be named President and HC of the XFL's Dallas franchise. The official announcement will be tomorrow. 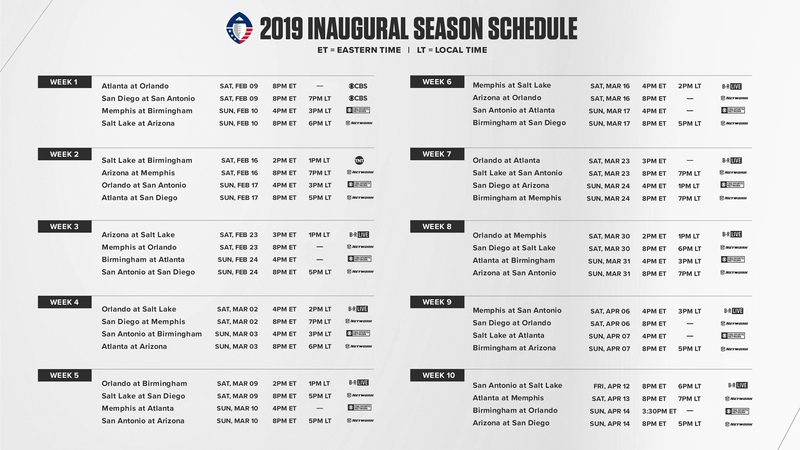 I'm actually looking forward to the AAF season, mainly because since the Falcons season was crap maybe the Legends can be off to a good start, but first 2 games on the road isn't ideal for sure. Anyone doing a Highway To AFFHam or Fantasy AFF? As cool as it is to have Salt Lake have a franchise in this thing, what mad man thought playing home games in February in UTAH was a good idea? In this part of the country it can be nice in march, but it also be really nasty. . . Wait, there's games on the NFL Network? I hate to say it, but if XFL adopts that for OT then I'll be a bigger fan of them than I thought I would be. I am assuming it is to ensure games fit into a certain time frame and so having an OT that is done in (presumably) 10 minutes would help that. Also the refs gear isn't very flattering. They got off to a flying start. I saw the first half of the San Diego/San Antonio game. I think the quality of football is well ahead of what we saw from the XFL, though that might be damning with faint praise. I enjoyed it, though. We got Orlando beating the hell out of Atlanta. Classic old Ball Coach running up the score 40-6. It was good I will watch it I know once March Madness hits I'll have to make an effort to remember it's on or those 3 weeks I'll forget it exists. The no kickoffs is very hard to get use to. As Orlando appear to have found a shipping container of Amsterdam Admirals uniforms I will have to adopt them as my AAF team. Trent Richardson fumbled once but had two Touchdowns in Birmingham's 26-0 Win.